This sculpture, called The Sunbathers, by Peter Laszlo Peri, is now on an internal wall in the Royal Festival Hall on London’s South Bank. The piece was made for the 1951 Festival of Britain, and was installed on a wall of the Waterloo Station Gate to the Festival’s South Bank site, on York Road. Like most of the Festival, the sculpture was not intended to remain there permanently – nearly everything on the South Bank, except for the Festival Hall, was swept away after the Festival closed. Perhaps The Sunbathers was always meant to be an occasional piece – many of the sculptures made for the event were destroyed. It’s not the greatest depiction of a pair of human figures, but it has significance of several kinds – historically, for its prominent place on the Festival site, compositionally, for the innovative way in which its position on the wall enforces an unusual viewpoint, and technically, because it was an experiment in making figurative sculpture out of concrete. However, like so much of the art made for the Festival it was long thought lost. In 2016, Historic England put on an absorbing exhibition in Somerset House called Out There: Post-War Public Art. The show included several images of lost public art, and asked visitors to submit information if they knew the whereabouts of any of these lost works. Two people responded that they had seen The Sunbathers in the garden of the Clarendon Hotel in Blackheath. 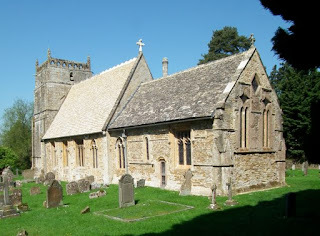 Investigation revealed the two figures, badly damaged, under a tarpaulin in the garden where they had been left with the hope of restoring them and displaying them somewhere. For over six decades, The Sunbathers remained a memory, of which readers of histories of the Festival and of Dylan Thomas’s essay about the event* were occasionally reminded. 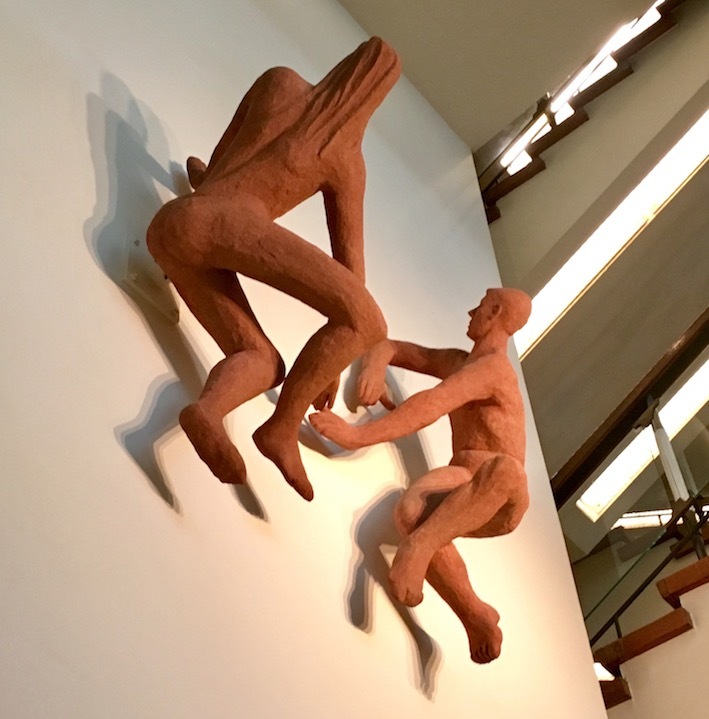 After a crowdfunded project to restore them, the figures are now on show inside the Festival Hall, not far from displays about the Festival of Britain and the origins of this famous concert hall. This spot on the wall in the foyer, a short walk from the work’s original home, does not seem a bad place for it to end up. * ‘The Festival Exhibition’, reprinted in Ralph Maud (ed. ), Dylan Thomas: The Broadcasts (J. M. Dent & Sons, 1991). 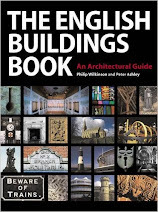 Note On 26 February 2019, I corrected the text of this post because as originally posted, the title of the sculpture and the date of the Historic England exhibition were incorrect. 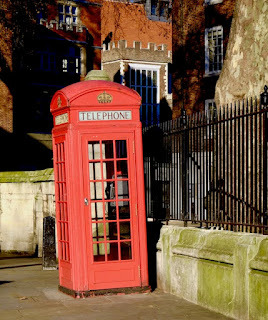 It was an instant success in terms of effective, recognisable design: from the 1920s on, until the 1970s, the ‘red box’ meant a public telephone – even if the later, slightly shorter and simpler K6 box was the one that was made in the largest quantities.§ The K2 has a taller upper part than the K6, gold crowns (which are pierced for ventilation), and a band of fluted moulding running around the doorway. Today, relatively scarce K2s are listed and although they can now be little used they are such a familiar part of the scene that it’s good to see them retained. This one did slightly worry me, though. Look and lean as I might, the box itself does seem to be leaning rather alarmingly. Every other building around it seems to be vertical, but the box is a few degrees out of true. I hope it’s stable, and continues to give visual pleasure and good service for many years. 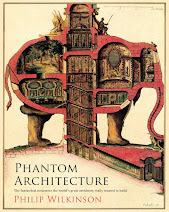 * To visit the current exhibition about John Ruskin, which is well worth catching. 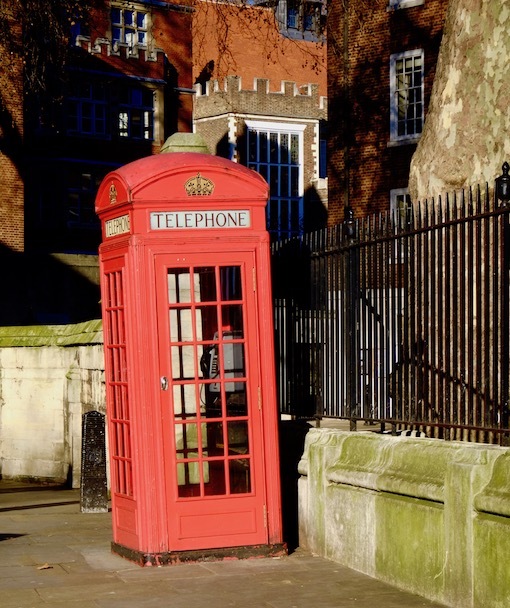 It’s a curious coincidence that I seem to notice telephone boxes when going to art exhibitions: see the links below for a couple of other examples. † My post about the prototype K2 box near the Royal Academy is here. § There is post about a K6 box near Henry Moore’s old house at Perry Green here. 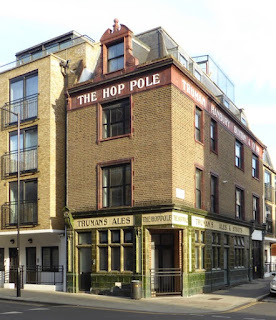 Crowning a rather utilitarian looking building on Old Street – mostly a mix of brick walls and long, metal-framed strip windows – is this fancy pediment carved in an elegant letterform ‘H. Snuggs & Co’. 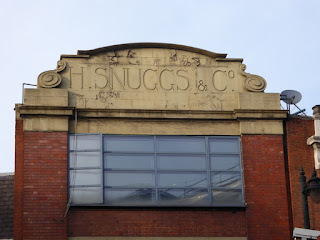 I can’t be the only person to have looked up there above the fourth floor and wondered who H. Snuggs was. He was, it turns out, an ironmonger, who was in partnership with Joseph Snuggs and John Edward Harwood in the late-19th century. 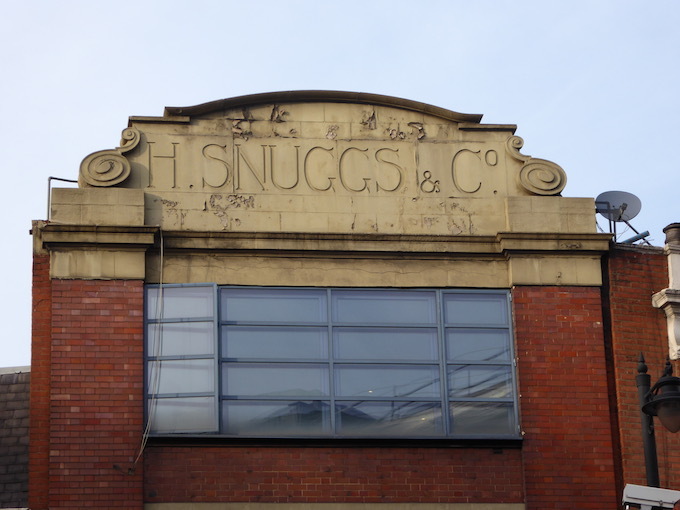 This partnership was dissolved in 1899, when Henry Snuggs seems to have left, but the firm carried on until at least the 1920s. The notice of the partnership’s dissolution in 1921 says they were ‘Wholesale ironmongers’, so they would have been supplying goods to many different retail outlets, probably mainly in London but perhaps further afield. Ironmongers offered huge ranges of stock, from cutlery and kitchenware to stoves, grates, doorbell systems, tools of all sorts, and, in the country, agricultural equipment too. No doubt those light upper rooms would have been full of such stock. It’s a tall, narrow building, and the sign, with its thin-stroked lettering, seems rather subtle for a commercial company that needed to signal its presence on a busy street. 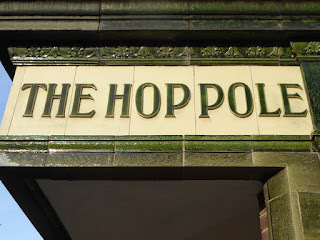 However, I recall a photograph from more than twenty years ago showing the sign looking rather different, with the letters picked out against a terracotta background, as if it, like the walls, were built of brick. 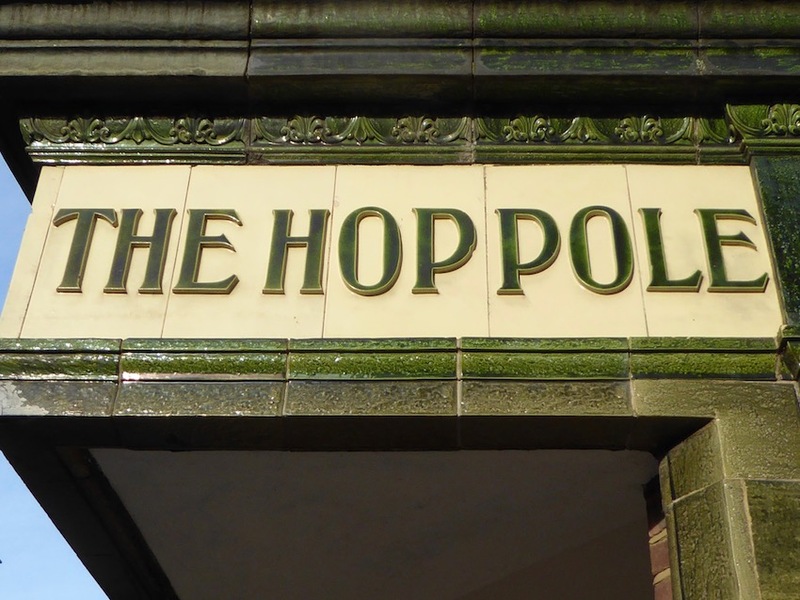 With this sort of colour scheme, and no doubt a bold sign lower down at shop-front level, it was probably clear to everyone where H. Snuggs was, and what it was he was selling. I often walk along Marylebone Road and I usually admire the Royal Academy of Music as I pass. The other day I did what I’ve always meant to do, and stopped to take a photograph. It’s a building of 1910 by Sir Ernest George, a good late-Victorian and Edwardian architect known for his country houses and his versatility (his practice designed all kinds of buildings from Golders Green Crematorium to mansion flats) but always rather in the shadow of his even more successful pupil, Edwin Lutyens. I like the well-mannered baroque of his Royal Academy design. The materials, red brick and Portland stone, are thoroughly at home in London, the facade looks rather like a country house, with its side wings, but is also urban, somehow – perhaps it’s the sense of height conveyed by those vertical ranks of windows and the tall chimneys. Towards the top it gets very fancy, with those round oeil de boeuf windows, the curved pediment, the reclining figures with musical instruments to hand, and the extraordinary window in the centre of the pediment, that can’t make up its mind whether it’s oval or rectangular. It’s majestic, but also very lively – in musical terms, maestoso, but with decidedly allegro passages. Altogether, it’s a building that enlivens my days when I pass, as the work of some of its alumni enlivens my evenings. 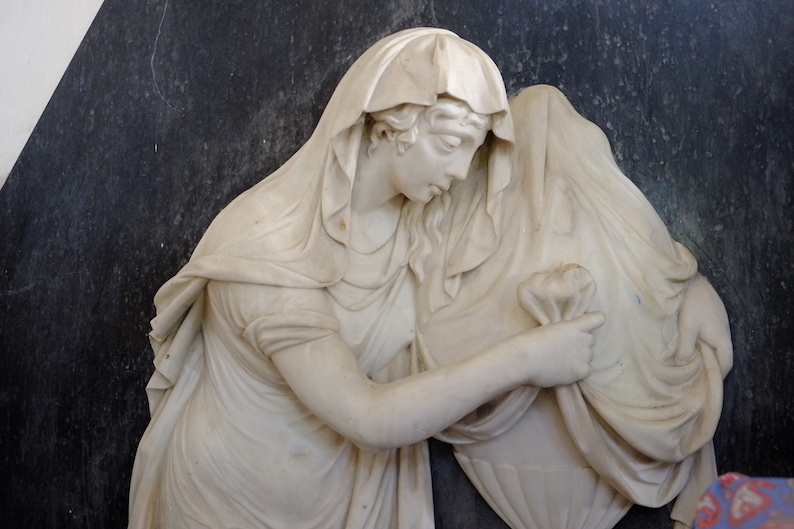 Here is the other monument that caught my eye in the church at Farthinghoe. It’s to George Rush, father of the two young women whose monument was the subject of my previous post, and he died aged 70 in 1803, just two years after his daughters. 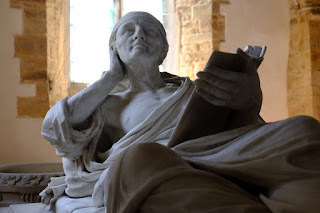 He was clearly a man of substance – the inscripton on the monument refers to him as ‘late Patron of the Rectory of Farthinghoe and Benefactor to the Parish’. He died, what’s more, at his house in Upper Brook Street, Grosvenor Square, London, an address almost as upmarket then as it is now. The family could clearly afford a good sculptor to do his effigy, and the man they chose was CharlesRegnart. Regnart was the son of a carver from Flanders who settled in Bristol, but by the time this monument was made he had moved to loved, where his studio was established in Fitzroy Square. His family claimed descent from Raginhart, a Goth who had fought with Alaric when Rome was sacked. If his ancestor really did take part in the fall of the Roman empire, Charles Regnart did not work in a Gothic style. This monument is classical in sensibility, and certainly striking in its quality. The sculpture shows Rush recumbent, holding a substantial book, presumably a copy of the Bible. But he has looked up from his reading, to stare not at us, but at something beyond, at the beyond, it may be, or at the sky or ceiling at any rate. His expression doesn’t look at all sad: maybe his heirs took heart that he had found consolation or inspiration from what he was reading. It seems that he had finished the book…and that the book of life was about to be closed. In my book, the carving is very good indeed. The face is well handled and characterful, the hands lifelike, the folds of drapery dramatically undercut. Even the book is believable – the thick leather binding, the pages delineated, some pages even slightly ruffled to tell us that this is a volume that has been used. I was very impressed indeed by this sculpture, and even though the lighting didn’t make it easy to photograph, I hope my image has captured its essence. Hats off to Mr Regnart. I hope that the family of the deceased found the monument consoling and maybe even uplifting. Over 200 years on, I was not a little uplifted myself.